Have us clean your carpets for you every 4-6 months or 2-3 times a year. Carpet manufactures normally having your carpets cleaned from a professional service that has a mounted steam cleaning van such as All Star Carpet Cleaning Kirkland, WA. By having us clean your carpets you will extend the life of your carpet. You do not ever want to scrub or rub spots to try and get them out of your carpet, if you were to do this it would permanently damage the affected area of the carpet. The proper cleaning method to cleaning up a spill is to scrape the spot towards the middle and then blot the spot with a cloth or towel. When vacuuming you want to do it frequently and thoroughly. You at least want to vacuum at least once a week. This will help maximize the health of your carpet and it will also help keep the dry soils to a minimum. Make sure not to overuse carpet detergents like shampoos and spot removers. It’s easy to fall in love with the carpet spot removers but using it to often can result in dirt attracting residue that will make your carpet appear dirty faster. All Star Carpet Cleaning Kirkland, Washington; is very professional and knowledgeable. They truly care about their clients and are very honest. 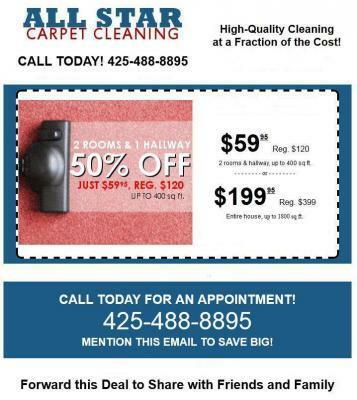 The standard of Kirkland, WA carpet cleaning has been set by this company.